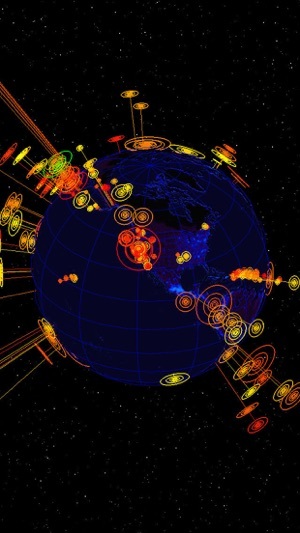 Zoom and spin your way around the world with this fully immersive 3D Earthquake display app. Earthquake 3D uses animated graphics to show you the "big picture" and visualize large amounts of Earthquake data quickly and easily. 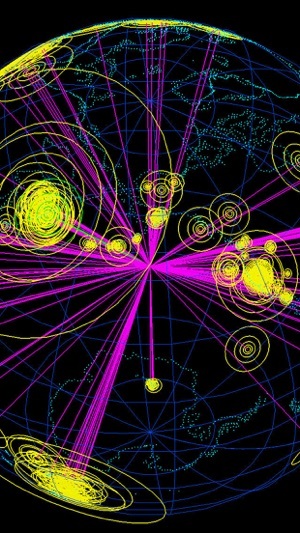 Go where no seismogram has gone before with a fascinating and mesmerizing look at the world's Earthquakes. - Eight different Earth display types that include population and tectonic plate maps. - Four different custom view 'presets'. - Solid and wire frame 3D views with transparent Earth ability. - A Sequencer that shows Earthquakes as they occurred using animation loops. - Control Speed, Decay, and Sound of Earthquake sequencer loops. - Includes 4000+ years of Historic Earthquake information. - Data from USGS, European EMSC, British Geological Survey, and New Zealand Geonet. - Current worldwide Volcano activity display..
- Includes DEX depth visualization. 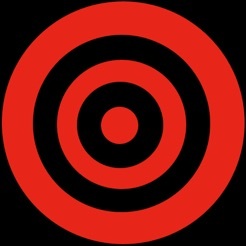 - Individual quake indicator 'flags' that show magnitude or depth. 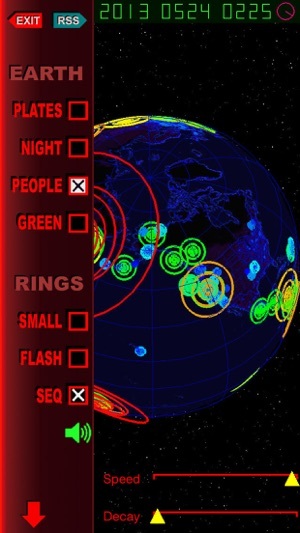 - Tap on individual indicator 'flags' to show details for each Earthquake. 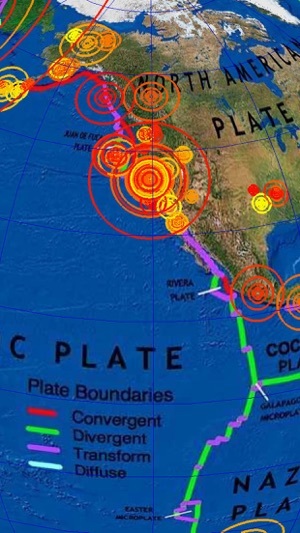 - Earthquake details include Local Maps, Local News, and Advanced Seismic Information. - Can import up to four external Earth images that are supplied by the user. - Uses "point and drag" to position and spin the Earth. Uses "pinching" for zoom. 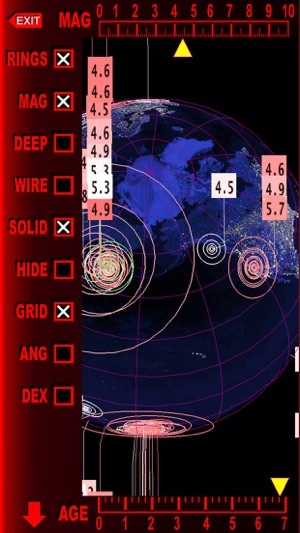 - Filter Earthquakes by magnitude and age with slider controls. In addition to providing several 'live' sources of current Earthquake information, an Atlas database is also included. The Atlas database shows over 4000 years of Historic Earthquake information. This database (updated periodically) is built-in to Earthquake 3D and is available even when you are off-line. This edition of Earthquake 3D represents a third generation of this very popular computer program. Started in 2003 as a desktop application, it has become a widely adopted standard for video presentations and visualizations of Earthquake information. This latest edition brings new features and updates to this modern classic. Whether you are exploring the geo sciences, or you just want to find out if you felt that last quake, this app will keep you up to date with the latest Earthquake information. Following Dutchsinse for years, I was always disappointed that I couldn’t follow along on my Mac. This is truly the next best thing. There’s a detailed tutorial which is a great help in the first setup and a great FAQ for new users. Most importantly, I can choose my data feed. I would highly recommend this app. It is worth every penny. Very limited compared to the Windows paid version. Infrequent updates, low-res maps even with a Retina display & only a few data feeds is very disappointing. Didn't expect it to have all of the Windows bells & whistles for $7, but it is closer in features to the free Windows version. Three stars only because it is still useful. This is a really amazing app for earthquake monitoring, incredibly detailed views and so many different ways to watch the Earth in real time with interactive high quality vector views, wireframe, 3D models chowing depth, magnitude and much more. Woth every penny and more. The iPad and iPhone versions are incredible;.